I was a shy child. Consequently, I spent a lot of time avoiding eye contact by looking down at the ground. All this time looking down at my feet allowed me to regard the ground upon which I was walking. 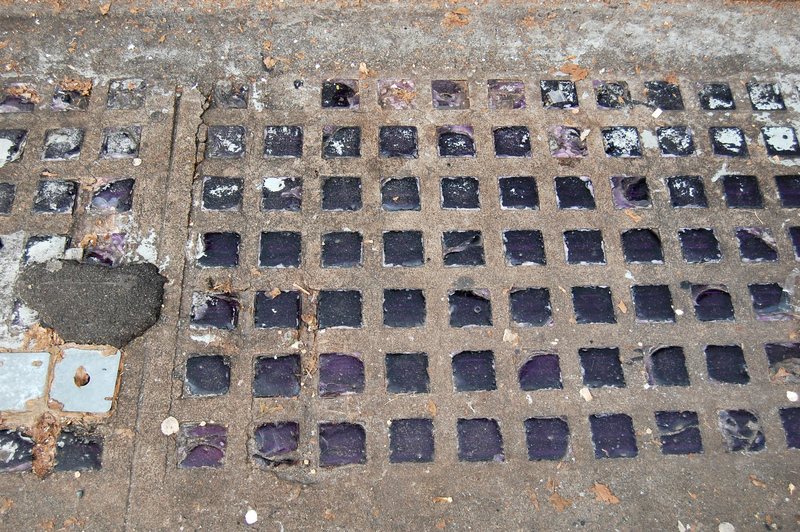 Thus it was as a child that I first noticed the purple squares embedded in sidewalks. 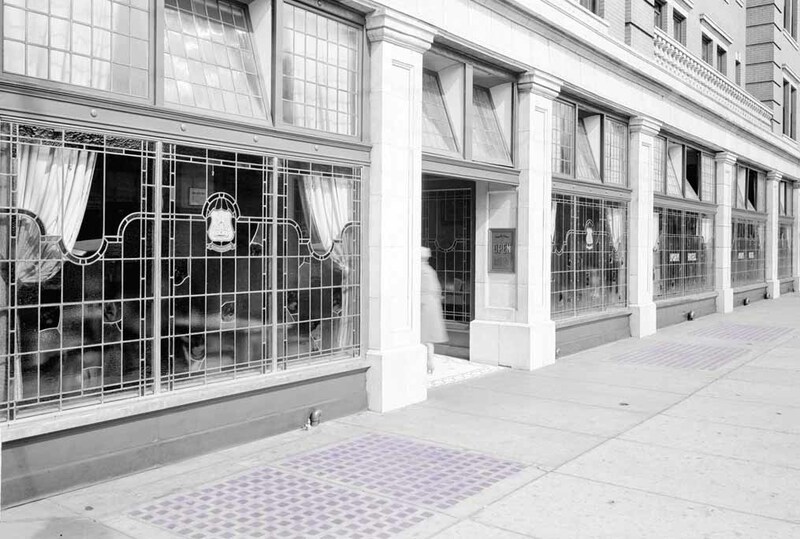 Have you ever been walking in an older part of the city and noticed a checker board grid of purple squares under your feet? No, they are not simply sidewalk decoration [wouldn’t that be nice?] 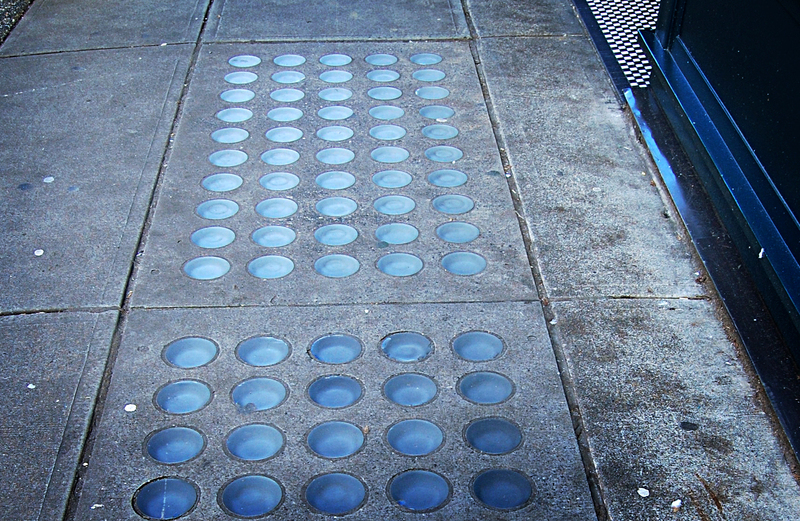 but rather a system to illuminate spaces under sidewalks called areaways. Sidewalk prisms, also known as vault lights (or pavement lights in the UK), are glass prisms set into sidewalks in order to reflect the natural light from above, safely illuminating these subterranean spaces. [Why are they purple? The answer to that is at the end of the post]. The concept for areaway lights came from a similar system used on ships starting in the middle of the 19th C. Deck prisms were used to safely illuminate the cargo hold by bringing in light without the use of candles – which could prove very hazardous on a wooden ship, especially if it was carrying flammable cargo. Later in the century this system of illumination was adapted for city use, and the sidewalk prism was born. What about areaways? In her interesting article on areaways, Justine Murdy explains that since Vancouver’s incorporation in 1886, property owners in the downtown area ( i.e. 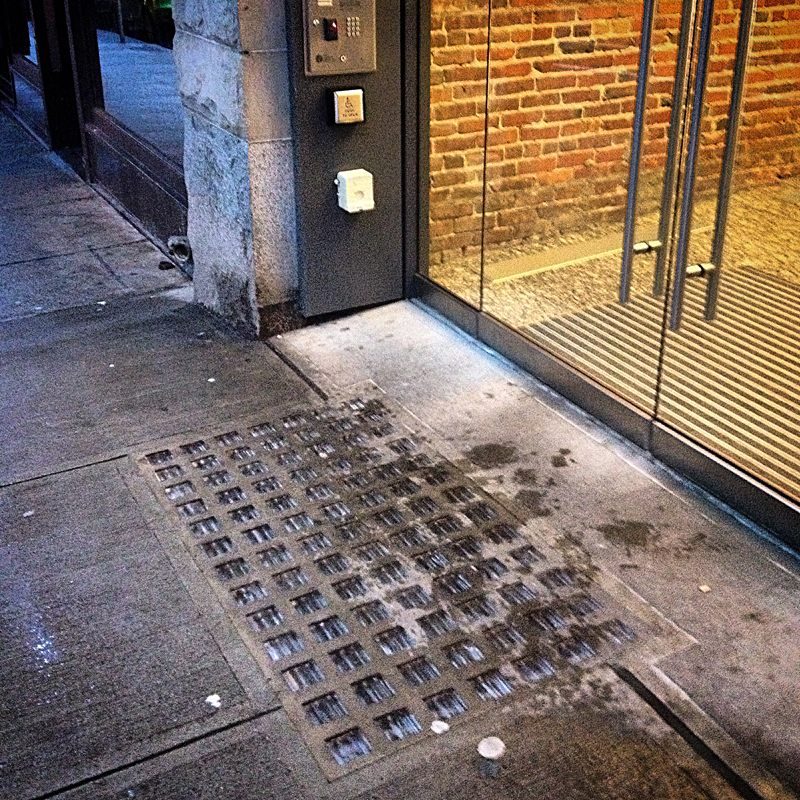 The CBD, Gastown, Chinatown) were charged “taxes for sidewalks that aligned their lots, even though using the space above the sidewalk wasn’t permitted”. Some property owners took advantage of this and decided to use the spaces below the sidewalks to expand their basement space. Murdy explains that “by paying a minimal encroachment fee to the City, basements could be extended into the area under the sidewalk” past the building wall up to the street wall. By the time areaways came into use in Vancouver, many other cities in North America and the UK were already using glass prisms to safely illuminate these spaces. The idea of lighting otherwise dark and dank areas with “pure, healthful, white light from wall to wall” was very appealing in the Victorian and Edwardian eras. Diagram showing sidewalk prisms from the Canadian Luxfer Prism Co. Ltd. catalogue, p. 25., ca. 1910. As Vancouver grew, so did its infrastructural needs. Since regular access to utilities (sewer, water works, electrical etc.) was required, it made more sense for the City to use the space under the sidewalk, rather than the street [which would disrupt traffic] to run and access these utilities. At the same time, businesses were shifting away from using coal as their main heating source, so all those coal chutes leading into areaways and basements below ground were no longer needed. In some cases, areaways were taken over by the City for its own use. The second half of the 20th Century also saw a lot of “modernization” in the city which resulted in new building projects and with them came new sidewalks, resulting in the loss of active areaways and sidewalk prisms. New safety regulations from the City engineering department also forced the closure of areaways – the sidewalk above had to be able to withstand the weight of an emergency vehicle parked on it. Areaways were filled in either permanently (with cement) or semi-permanently (with gravel). Such is the case with the historic Hotel Europe, the areaways beneath its sidewalks which once housed among other things a saloon, are now filled with gravel. This is at least a potentially reversible situation. 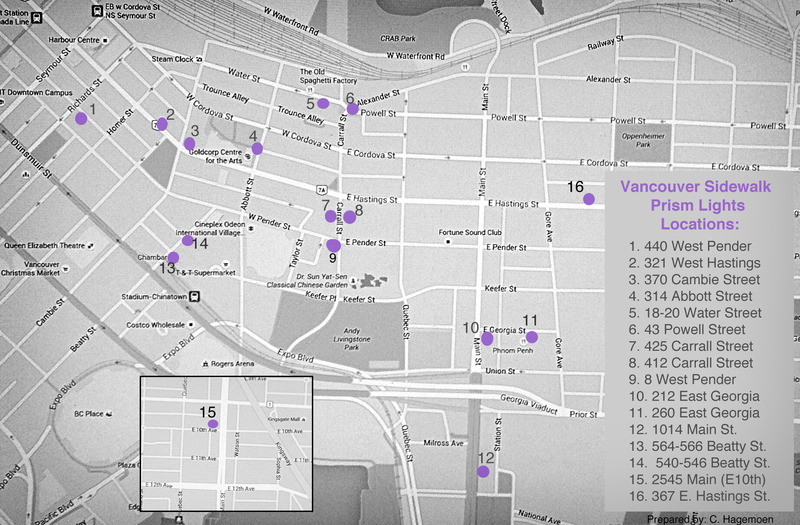 It seemed to me that I came across those ‘purple squares’ less and less over the past 20 years and I wondered just how many examples were still around in Vancouver. 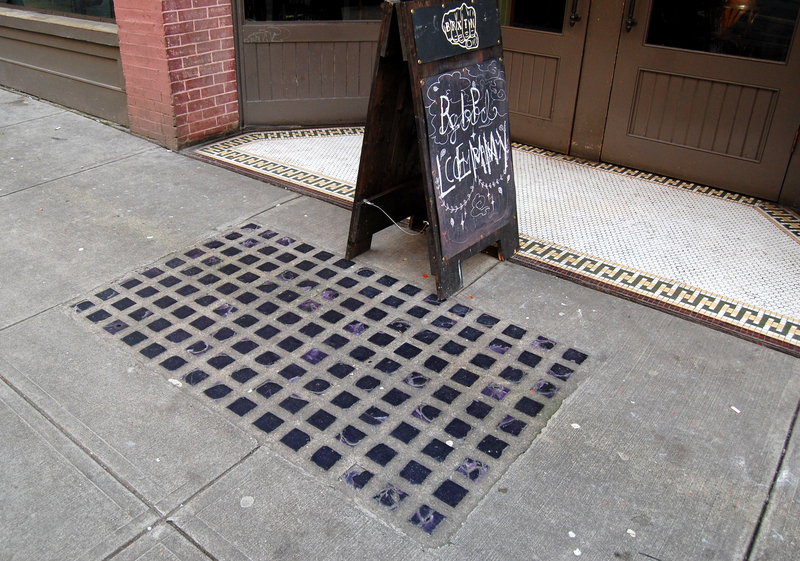 With a little research, I discovered this vault lights (aka sidewalk prisms) map by Samantha Knopp. I used it as a foundation and tried to locate the 12 vault (or prism) lights spots on the map. Unfortunately the exact locations are rather vague, and I had a little trouble at first finding the locations as indicated on the map. After some map/street orientation and then walking around trying to confirm the exact location of each spot, the primary thing I discovered is that some of the locations didn’t have any sidewalk prisms at all! My fear was that they were disappearing faster than I thought! Still, this map provided a starting point for my own discovery. I was determined to create my own (detailed) map and walking tour of the sidewalk prisms of Vancouver primarily to determine the current state of sidewalk affairs. So, I present the result of many, many hours spent researching and walking around the city (looking at my feet). I hope that, through word of mouth, other locations will be brought to my attention and we can add them to the map. Map of sidewalk prisms locations. Prepared by C. Hagemoen using Google map base. (click on image to view) There is one spot (#17) at 1180 Homer that is not included on this map. 1. 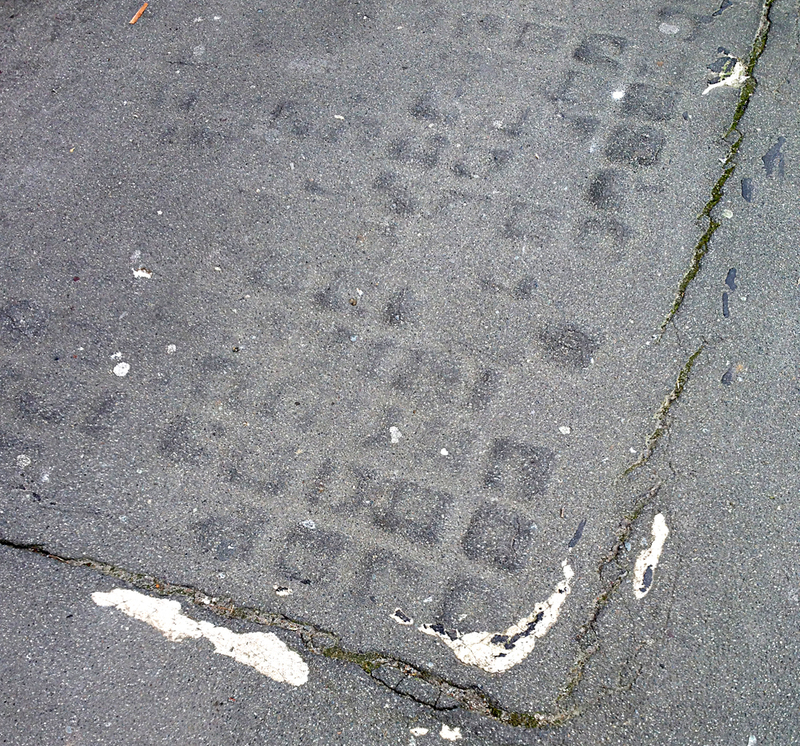 Original sidewalk prisms in front of 440 West Pender St. Photo: C. Hagemoen, CC-BY-SA 4.0. 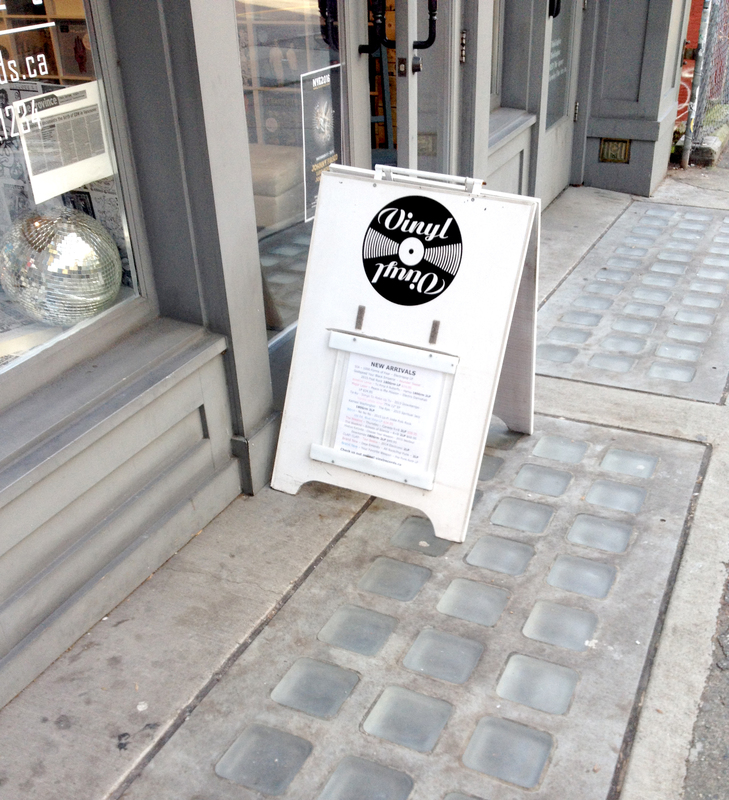 Stop #1 – 440 West Pender (in front of Bangtown Hair Salon) – Original. 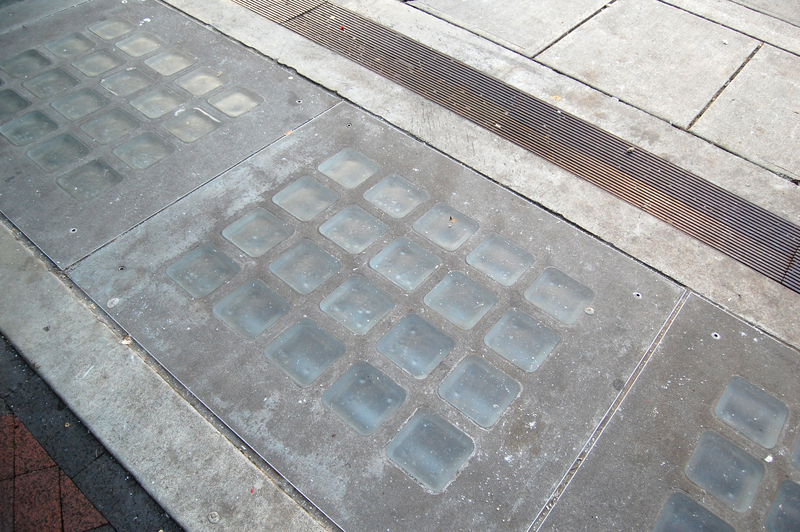 These are a fine example of original sidewalk prisms, enhanced by the use of lights below the surface. The building dates from 1909. This block of West Pender used to have quite a few sets of sidewalk prisms and areaways. Old photographs of the Vancouver Board of Trade Building (1913), located on the corner of West Pender and Homer, reveal that the building was surrounded by them. #2. 321 West Hastings (in front of Vinyl Records) – Restored. This is a small example of sidewalk prism lights in front of a building originally constructed in 1904. Note that this restoration using new round prisms (fairly unique, historically for Vancouver) takes into account the sidewalk load restrictions for areaways and sidewalk prisms as laid out by the City’s Engineering Department. #3. 370 Cambie Street – Restored. Part of the Flack Building restoration of 2009, and skirting the entire sidewalk along this corner building, 370 Cambie is a great example of a restoration that utilizes the entire available areaway. 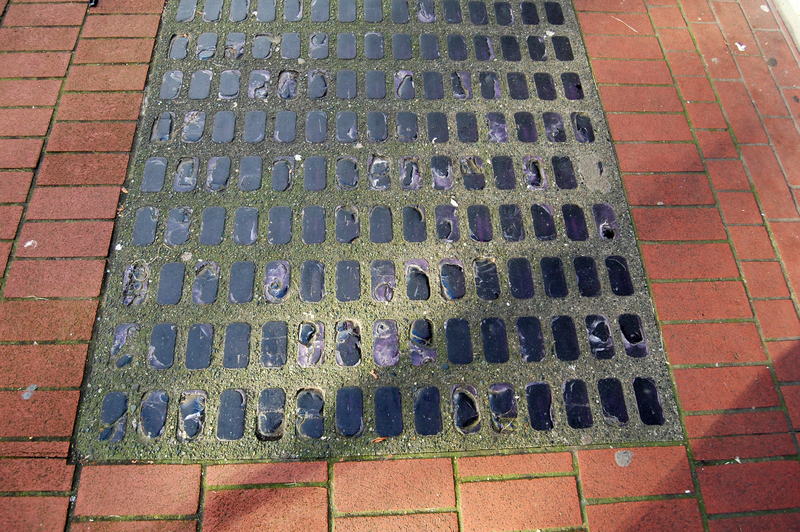 Note that this restoration using new round prisms (fairly unique, historically, for Vancouver) takes into account the sidewalk load restrictions for areaways and sidewalk prisms as laid out by the City’s Engineering Department. #4. 314 Abbott Street – Restored [?] I have to admit this sample confuses me. Part of the large Woodward’s re-development project (2010), I find this to be an awkward example of sidewalk prisms. This small (and, somehow, a little sad) sample is located in an out of the way spot along Abbott street. According to city records, there used to be a tunnel and several “voids” under the sidewalks on the former Woodward’s retail property. Since they were not being used, they were filled in prior to the redevelopment of the property. Ostensibly, this example of sidewalk prisms is a historic nod to the property’s former glory, but seems to lack weight or context. None the less, it’s worth the stop to see the other sidewalk embellishments nearby. #5. 18-20 Water Street – Restored. The sidewalk prisms in front of the Edwardian era Roberts Building are another great example of a modern restoration in historic Gastown. The original four-story plus lower level commercial mixed-use rooming house building dates from 1911 and is in the Vancouver Heritage Register. #6. 43 Powell Street – Hotel Europe (corner of Alexander and Powell Streets) – Original. A fine example of original sidewalk prisms (“Luxfer Prisms”, according to the ca.1910 Luxfer catalogue), which surround the entire six-story “flatiron” shaped building (1908-09). The Hotel Europe’s first owner, Angelo Colari, developed the areaway under his hotel to house the Tivoli Saloon. These prisms were “saved” during the Gastown revitalization project of the early 1970s, as the brick sidewalks encircle the sidewalk prisms sections. However, the areaways underneath were filled with gravel in order to support the sidewalk above. This is a non-permanent solution and could be reversed if the property were to undergo a restoration. #7. 425 Carrall Street – Original. These sidewalk prisms are along the Carrall Street side of the former BC Electric Railway Co. building which dates from 1911-12. This building was the headquarters for BC Electric until 1957, after which the main floor street car barns were enclosed to house a bank. Unfortunately the sidewalk prisms are in very poor condition and I fear for their future. #9. 8 West Pender – Restored. Sam Kee Building. This internationally renowned narrow building was built in 1913 and includes a lower-level extension beneath the sidewalk, in which original owner, Chang Toy, created a public bathhouse. 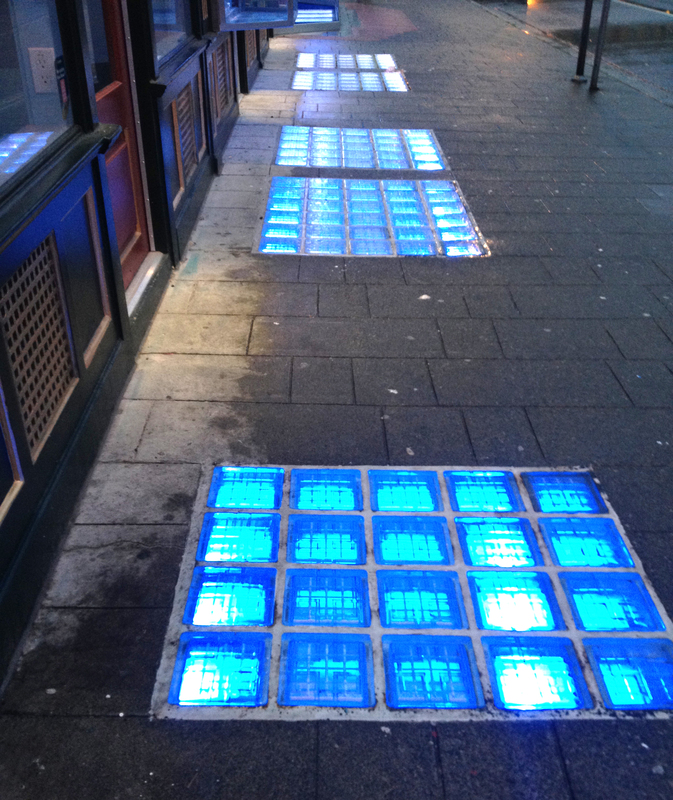 The glass blocks in the sidewalk are illuminated by coloured lighting underneath, so to be visible from above. #10. 212 East Georgia – Original (preserved?). This is a lovely, small example of a preserved piece of history at the entrance to the Brixton Pub. This four-story section of the historic (1903) London Hotel (208 East Georgia) was built in 1910. I really like this sample as it proves that a complete restoration of sidewalk prisms and areaways is not always necessary/practical for historical impact. In this case, a little goes a long way. (This may be a perfect point in the tour to stop for a bit of refreshment). #11. 260 East Georgia – Original. Outside the Tin Lee Supermarket (located in a two-story brick building that possibly dates from 1909-10) in the heart of Chinatown, these prisms are an excellent example of what you would have seen all over Chinatown at one time. 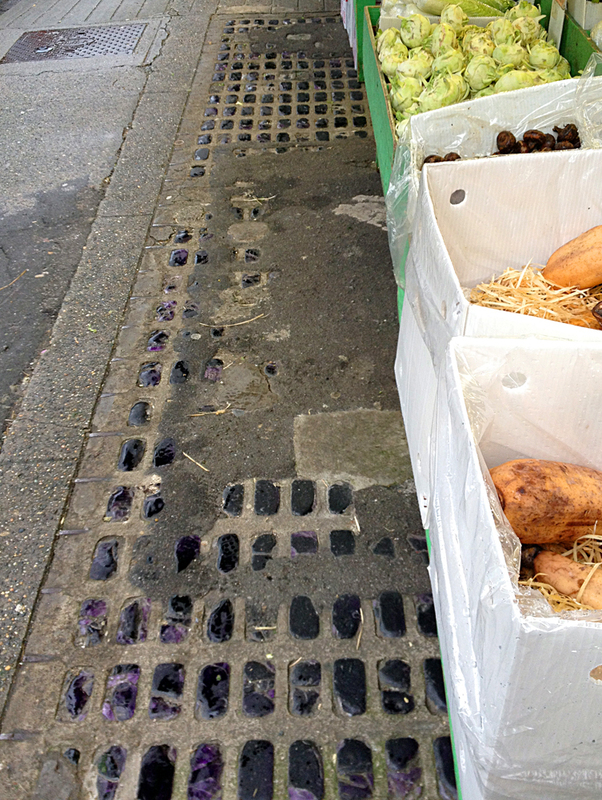 The sidewalk prisms are often covered by produce display boxes, which may be assisting in preserving them or hastening their deterioration. Hopefully it is the former. #12. 1014 Main Street – Original. 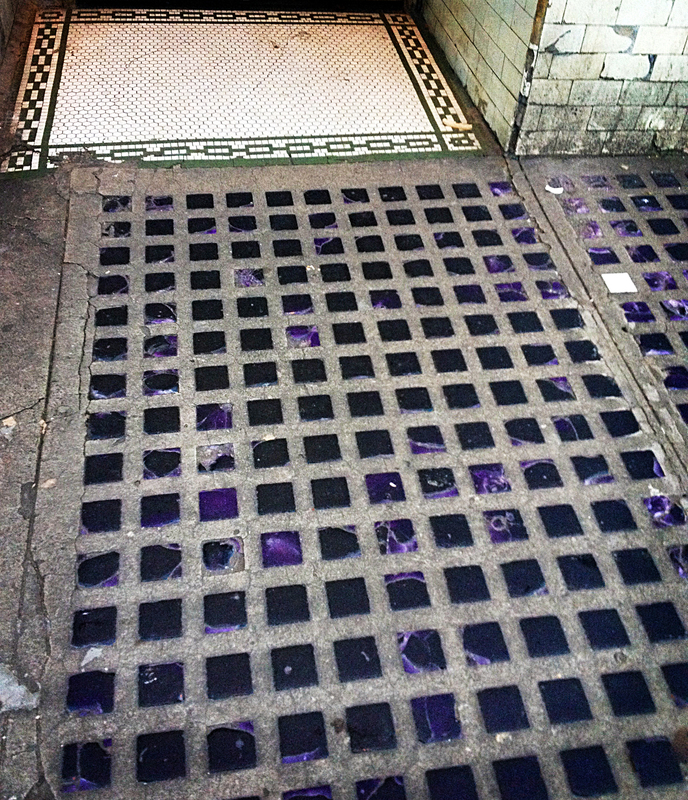 In front of Bodega on Main, these are an interesting example of original purple sidewalk prisms. They appear to have been covered by some sort of “clear varnish” that has discoloured over time. Ostensibly this was done to preserve the integrity of the prisms and prevent further deterioration? According to some accounts, the areaway beneath the sidewalk is still in use and is accessible from the restaurant. (If you didn’t stop at the Brixton, perhaps a stop here is in order). If you have time for only one stop on the tour, then 500 block of Beatty Street is the place for you – a sidewalk prisms mecca! #13. 564-566 Beatty Street – Restored. The sidewalk prisms in front of the Beatty Gate building (1909-1912) have been restored according to the sidewalk load restrictions for areaways and sidewalk prisms as laid out by the City’s Engineering Department. #14. 540-546 Beatty Street – Restored. This is a grand display of sidewalk prisms in front of this former industrial building. 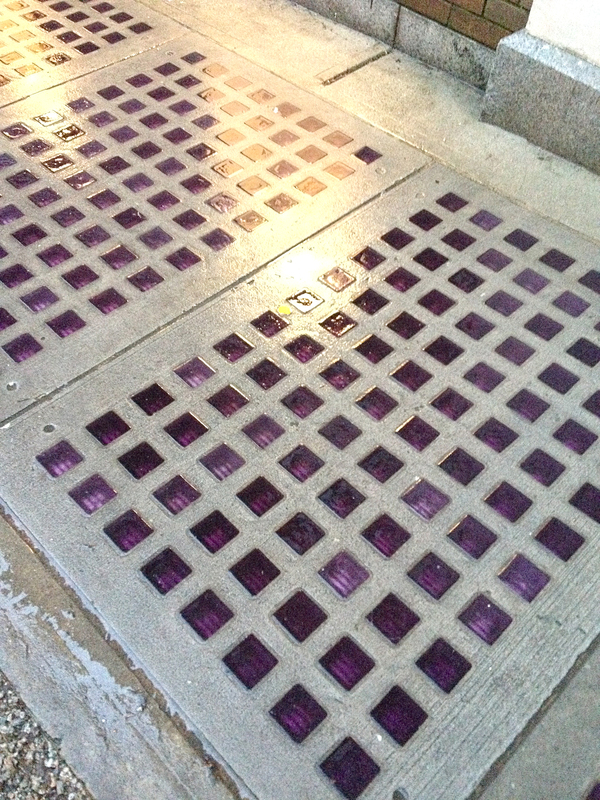 The sidewalk prisms were restored utilizing purple glass to mimic original historic sidewalk prisms. My favorite example of restored sidewalk prisms, as they are a most faithful reproduction of the historical sidewalk prisms commonly found in old Vancouver. The areaway beneath the sidewalk is accessible from the lowest floor. The Crane Building was built in 1911-12 as a warehouse, showroom, and offices for Crane Co., suppliers of steam, mill, and plumbers’ supplies. #15. 2545 Main St. – Original (but covered). Serendipitously found along the E. 10th side of Belvedere Court (formerly the Harris Block), which dates from 1911-12. I was very happy to discover this example of sidewalk prisms for several reasons. First, the location is outside of the downtown core, but still located in a historic Vancouver neighbourhood (Mount Pleasant). 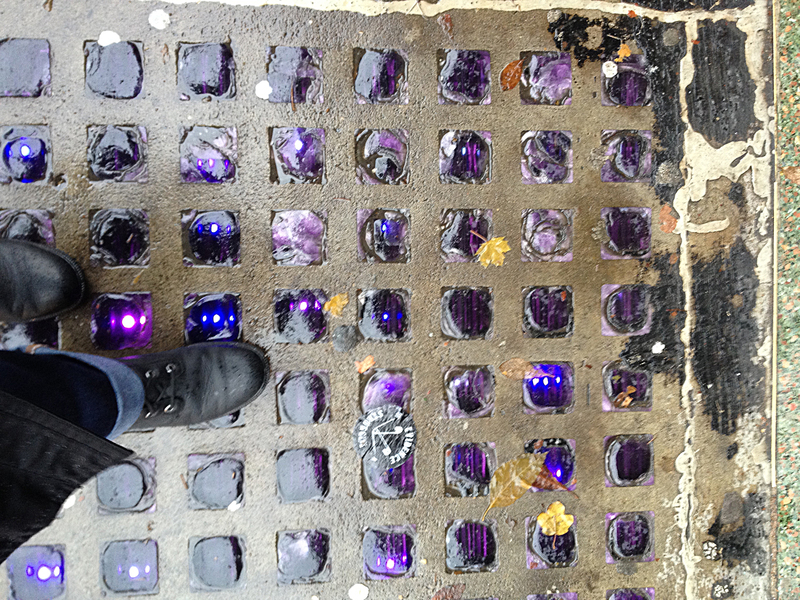 Second, it is a visual example of what commonly happened to sidewalk prism lights, once they become damaged and a hazard – they were covered with asphalt and only an impression of them remains. #16. 367 E. Hastings Street – Original. 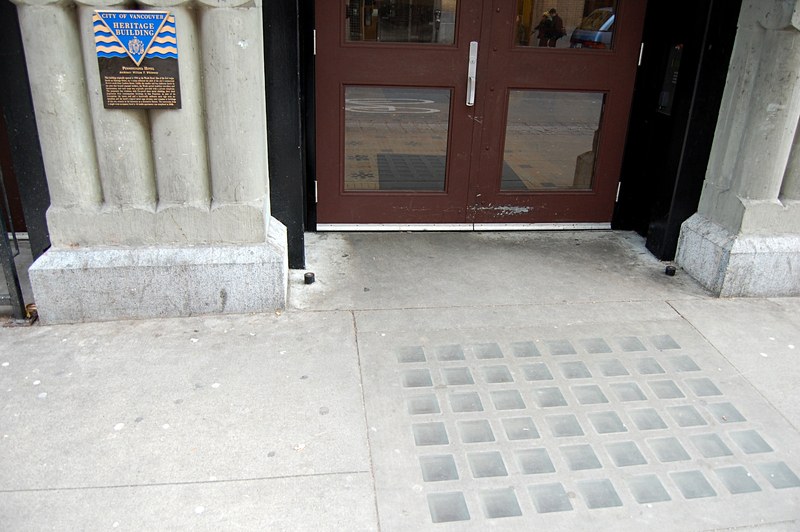 This excellent example of original sidewalk prisms is located in front of a brick building, constructed in 1911 for G.A. Hankey. It was originally known as the Hankey Block and was home to Holborn Rooms, a rooming house/hotel. #17. 1180 Homer Street – Restored. Outside the Mc Master Building a 1910 brick building, designed by Campbell & Bennett, that was completely re-built ca. 2006 utilizing the original facade. 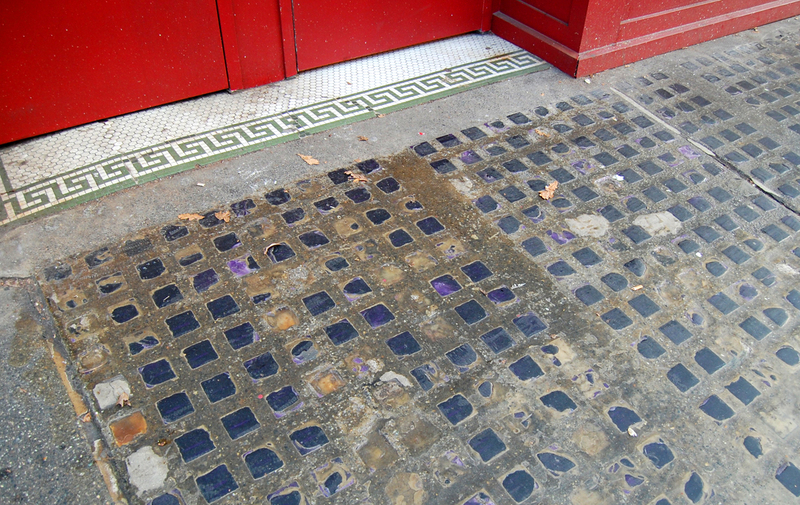 Historic looking purple glass sidewalk prisms were incorporated into the re-build. Excerpts from CBUT’s “Summer Afternoon” featuring sidewalk prisms on East Pender St. in 1957. Recently, I have been noticing the occasional nod to Vancouver’s sidewalk past with new building developments. 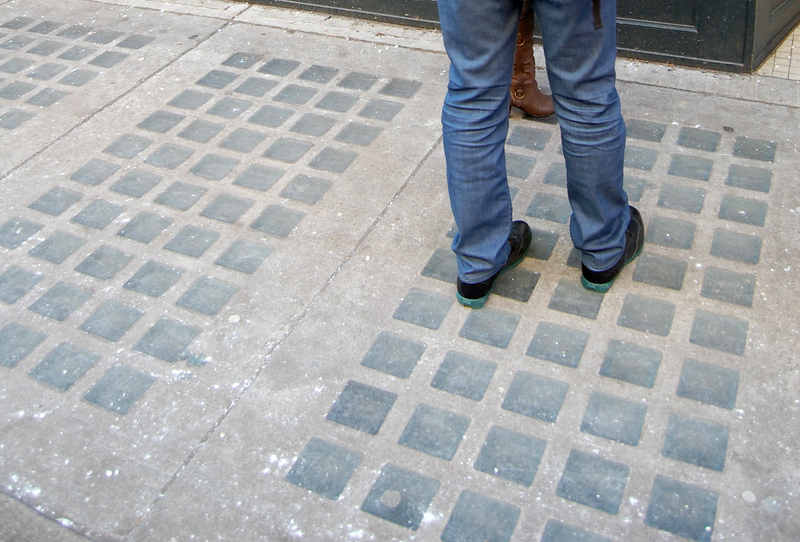 Modern interpretations include square grid patterns in the concrete or even contrasting squares embedded in the sidewalk. Take for example the sidewalk outside The Crossroads development at Broadway & Cambie, there is no denying that these green squares are reminiscent of the sidewalk prisms of the past. To me, the preservation of areaways and sidewalk prisms is akin to setting a nice table for a great meal – first impressions make all the difference. Entering a dining room to a beautifully set table, is like entering a building where all the external historical elements are in place. I learned so much information about sidewalk prisms and architectural heritage that there was no possible way to fit it all in one post. 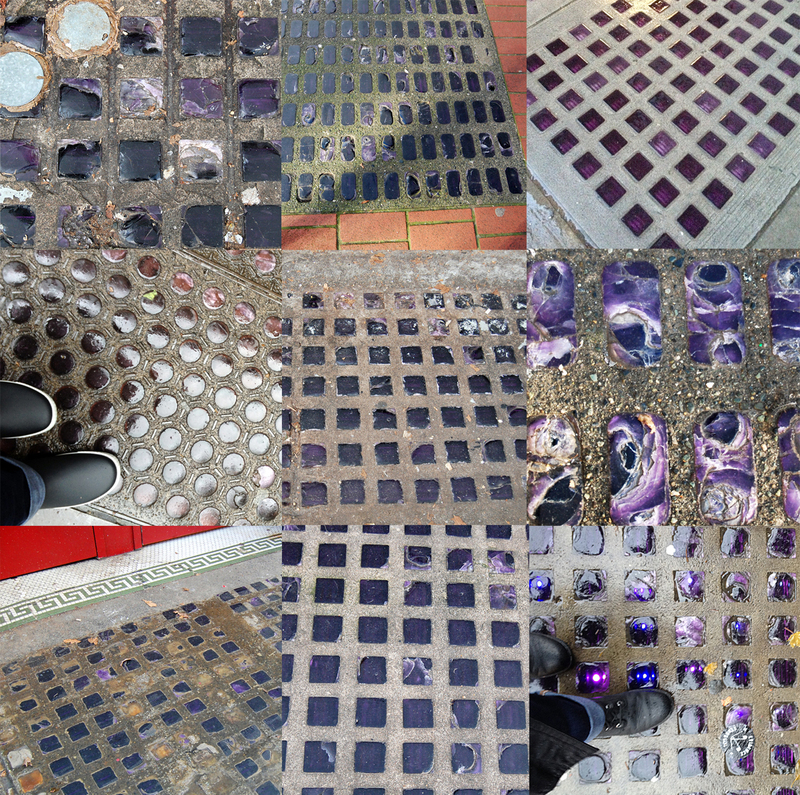 Stay tuned, there may be a Sidewalk Prisms of Vancouver post – Part 2, coming soon. Update: I wrote about Sidewalk Prisms for Scout Magazine, in April 2018. That version includes a cool interactive map. Lovely expanse of sidewalk prisms outside the old Birks Building at Granville and Georgia ca. 1972. Before the building was demolished in 1973. Photo: CoV Archives, CVA 69-21.16. Update: In February of 2017, I discovered another set of original sidewalk prisms on the 300 block of E. Hastings (stop #16). I’ve updated the walking tour map and this post to reflect this addition. 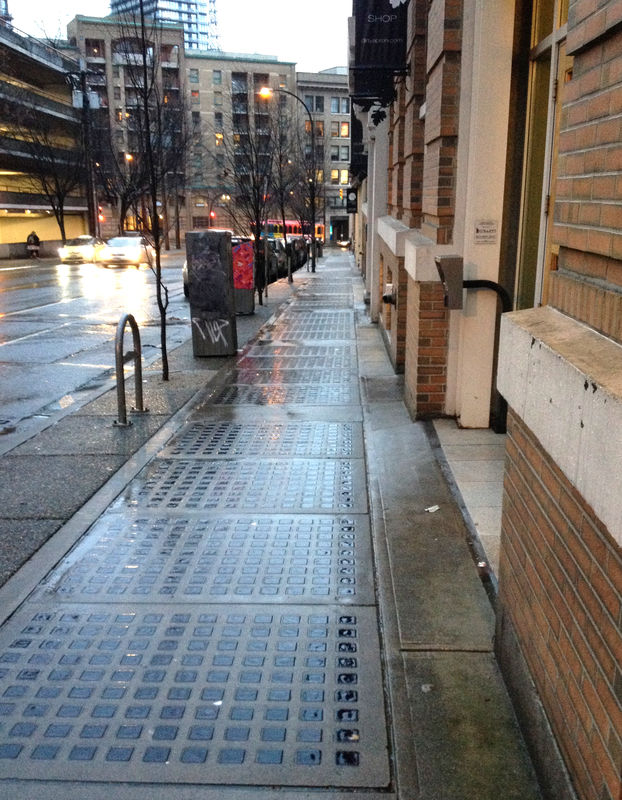 After I wrote my Scout piece a reader told me about another set of sidewalk prisms at 1180 Homer (#17). Special thanks to heritage architectural consultant, Donald Luxton for meeting with me in person and providing me further illumination about sidewalk prisms and filling me in on areaways in Vancouver (no puns intended… well, maybe just a little). 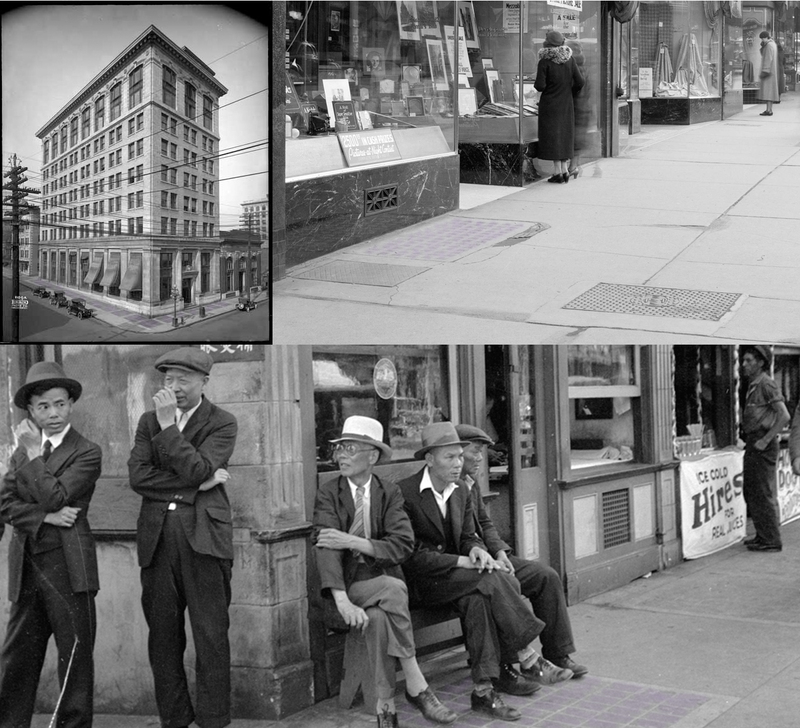 Fun Fact: The reason original sidewalk prisms are purple is that manganese was added to the glass in the late 19th and early 20th Centuries. When exposed to UV light or sunlight, the manganese turned purple or amethyst over time. The amount of manganese added determined how deep a purple colour the glass would turn. Again I am so incredibly impressed. Well done! 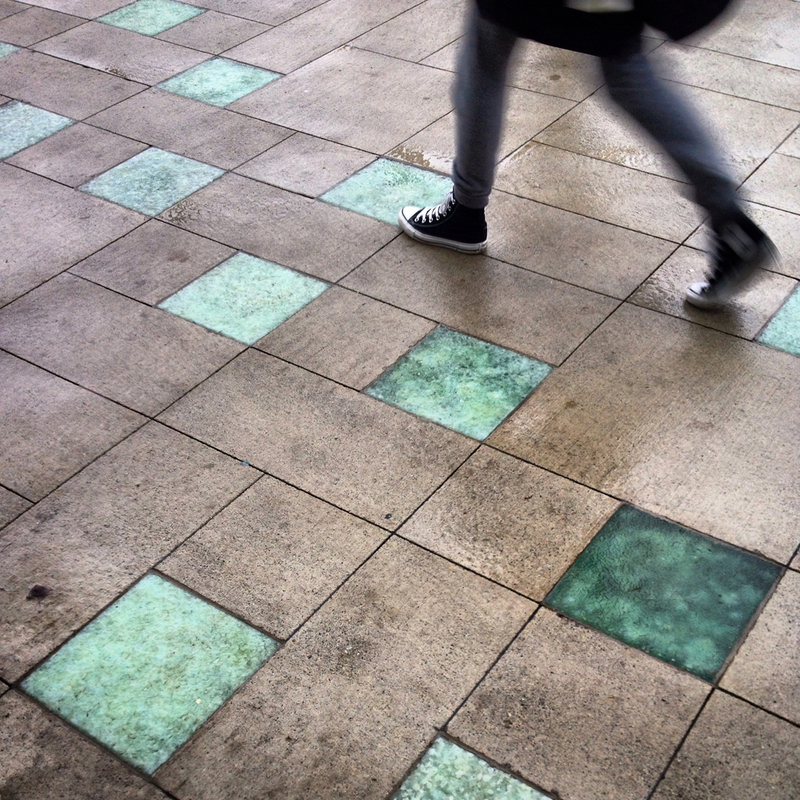 Thank you for this thorough look at Vancouver’s sidewalk prisms. I am in Buenos Aires where they are also numerous. Thanks, it’s interesting to hear that Buenos Aires has many sidewalk prisms. I imagine that they are all original. Are there any restorations like in Vancouver? Thank you for the answer to a question I didn’t know I was asking! Part of my brain may now rest…. Thanks for the sidewalk prisms siting! Coincidentally I was looking up that cafe on the internet yesterday for another reason… how cool! I will check it out and add them to the list! I know all about the most excellent website from Victoria and the images they have of prisms. There was a lot of stuff I wasn’t able to fit into my post, that was one of them. I think I will add a list of resources ( including that one) that I think might be interesting to readers at the end of the post. The reason for the purple glass is interesting. This purple colour probably reduced the amount of light. Do you know if this purple manganese glass was used in other parts of the world. Thanks for the article…I was always intrigued about these glass prisms and knew they were to let light below, but now I know the whole story. Yes, I imagine the purple prisms would greatly diminish the light entering. It appears that manganese was an additive for glass in other parts of the world including the UK and US. Very interesting post. I was just down in Cambridge (Boston) for two weeks and my friend, a local, pointed out the purple windows in old houses, which is very common. I forgot to Google the reason for the purpleness, but now I don’t have to – manganese! Thanks, and so cool to hear that windows also became purple over time. I’ve seen examples of more decorative purple glass, but never knew about windows. But it makes sense if manganese was part of the glass formulation. Sidewalk prisms a walking tour around Vancouver. Some very interesting facts and answers to how come these are in the sidewalks. If you are looking for info on walking tours in Vancouver I would simply do a Google search for “walking tours Vancouver” or “walking tours Vancouver history”. There are quite a few options to choose from. Some of the historical groups offer tours, some companies offer them as well. I did a post a couple of years ago on walking tours in the area It may give you some ideas. Good luck! Fantastic! Thanks so much for the info. Thank you for writing this article. I discovered prisms on the Underground tour in Seattle and was thrilled that prisms also existed in my hometown of Vancouver. What I didn’t see was if you experienced the view from underneath. It was amazing that the purple glass that looks so opaque from up top and when you go down underneath it’s completely clear, even on a cloudy day. I’d love to hear of how you could view these sites from the basement view. Thanks for your comments Devon. Last fall I was in Seattle and regret not taking the tour to see the view from underneath. (you may notice that one of my photos features the round prisms found in Pioneer Square). To my knowledge, the is no public subterranean access to the sidewalk prisms and areaways featured in my post. I suppose the only way is to ask permission of the business or property owner. Have you been to Calabash Bistro? There are sidewalk prisms at the entrance. The really cool part is that the bar downstairs actually extends beneath the sidewalk. You can see them from below on the way to the washrooms. It’s on 428 Carall St. Yes I knew about those prisms outside Calabash, I included them in my stop #8 as they are part of that restoration (though I didn’t indicate as such). What I didn’t know is that you can actually see them inside the restaurant! How cool! I will have to make a stop there soon! Great post. There’s also sidewalk prisms outside of Celebrities on Davie. Thanks Brett. And thanks for the tip about sidewalk prisms outside Celebrities on Davie, I will definitely check that out. Your photos are lovely. Could you please contact me about using them? Apologies for the double post. There is access to the areaways under some of Vancouver’s sidewalk prisms, as there are restaurants there; see the Wikipedia article for a link to them. Thanks for the info. I knew about some of them. I was lucky enough to travel to San Francisco last year and see some sidewalk prisims from below at City Lights Books…very cool. Love this post. Was admiring some lights today in front of Celebrities Nightclub on Davie St that could be added to your list.